Quick & Easy Tomato Chipotle Salsa is a must have for Mexican food night at home. Fresh & packed with flavor without any preservatives! Weight Watchers friendly- 0 SmartPoints! I love Mexican food. There’s no denying that. I grew up eating Tex-Mex so it’s in my blood. Now that I live in the Midwest and I’m no longer living in Tex-Mex land, I crave Mexican food on a daily basis. Luckily, I can make a Tex-Mex feast at home! My Quick & Easy Tomato Chipotle Salsa is a must for any Mexican food night at my house. 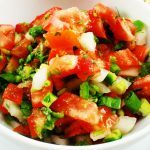 Fresh tomatoes, cilantro, onion, and peppers mixed in a blender for a quick and easy homemade salsa! This is a Weight Watchers friendly recipe and half a cup of salsa is 0 SmartPoints. There is nothing better than going to a Mexican restaurant, eating chips and salsa, and drinking a margarita. That was kind of a regular thing for me back when we lived in Texas. Now that we are in the Midwest, my husband and I just recreate those nights at home! It’s actually more fun that way. No need to dress up! Anytime I cook Mexican food at home, I have to make homemade salsa. I’ve bought so many different kinds of jarred salsa but it’s just not as good as homemade. 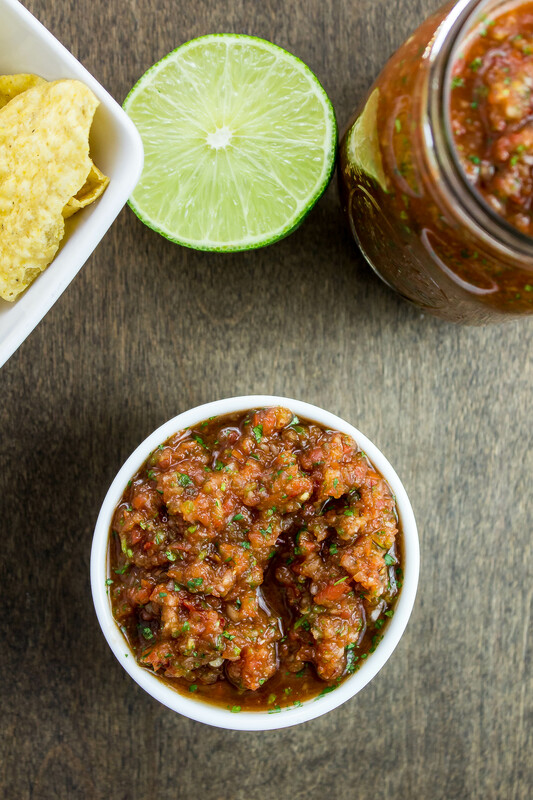 Making salsa at home is so rewarding because you can taste the freshness of the ingredients. 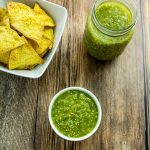 There are a ton of recipes out there for homemade salsa, but what makes my salsa a bit different from the rest is the chipotle pepper. It’s super subtle in the salsa, but gives it a level of deep flavor you wouldn’t be able to get without adding this pepper. The title to this recipe says it all… it’s quick and easy to make!! 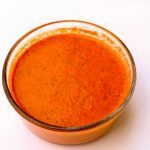 To a food processor (or blender), just add seeded roma tomatoes, jalapenos, white and green onion, chipotle pepper, liquid from canned chipotle peppers, garlic powder, salt, lime juice, and cilantro. Blend until you reach the consistency you want then enjoy! 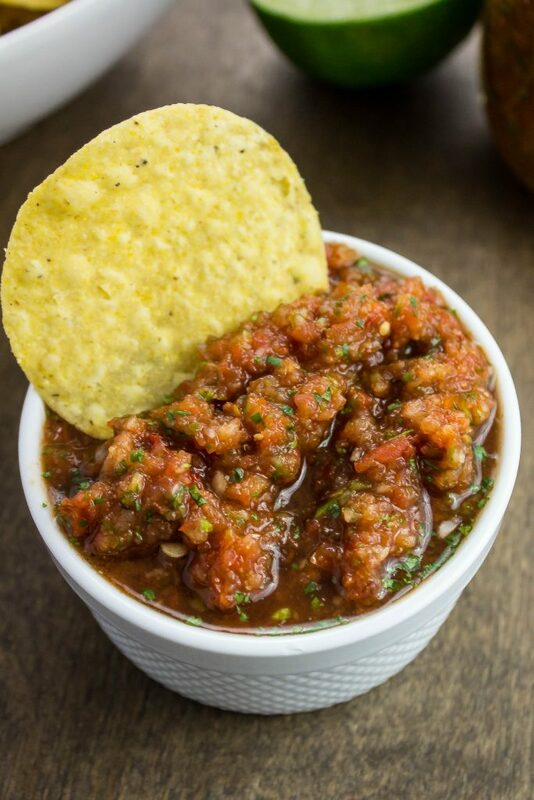 I like my salsa little chunky but you can blend the salsa as long as you’d like. I recommend making this salsa a day before you want to serve. The longer the salsa sits in the refrigerator, the deeper the flavors develop. Quick & Easy Tomato Chipotle Salsa is a must for any Mexican food night at home. 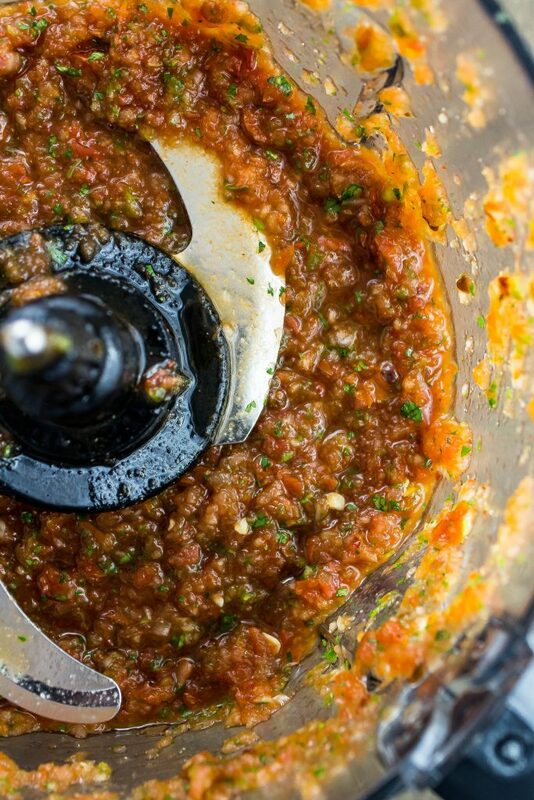 Fresh tomatoes, cilantro, onion, and peppers mixed in a blender for a quick and easy homemade salsa! This salsa will stay fresh in the refrigerator for up to one week!! Fresh and packed with flavor without any preservatives! 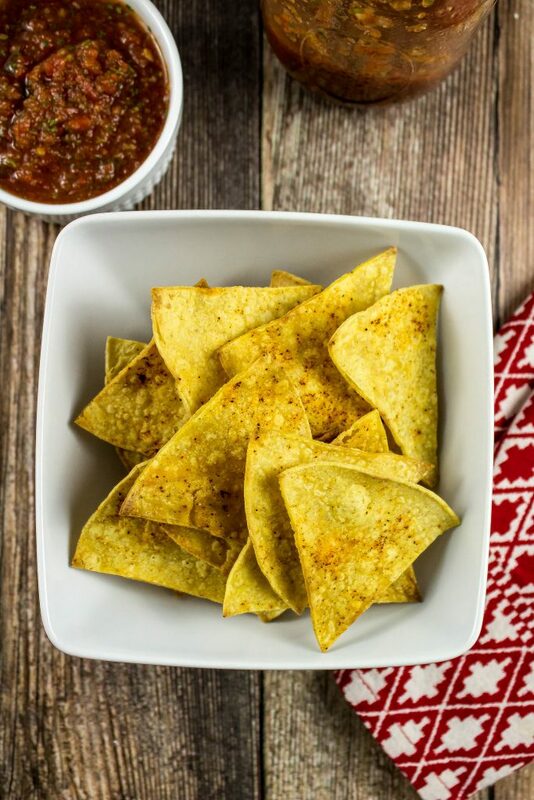 Serve with my Baked Tortilla Chips! Remove seeds from tomatoes. To remove seeds, lay tomato on a cutting board so the stem faces the side. Cut the tomato in half and using a spoon, scoop out the seeds and the liquid from the tomato. Discard seeds and liquid. Coarsely chop tomatoes, jalapeno, white onion, and green onions. Add to food processor. Add chipotle pepper, chipotle liquid, garlic powder, salt, lime juice, and cilantro to food processor. January 20, 2017 at 12:32 pm Me too!! Thanks so much Ashley!! January 20, 2017 at 1:33 pm Yum this looks awesome!! My hubby loves Mexican food and would love this recipe!! January 20, 2017 at 2:26 pm It sounds like it has some bite to it! Love the tip to let it sit for a day to add to the flavor, and the info on the shelf life. January 20, 2017 at 6:05 pm Yeah it has just a little bite to it :) Thank you Kirste! January 20, 2017 at 5:04 pm This looks amazing. I might try this for Superbowl. January 23, 2017 at 10:48 am Thanks Cindy! I hope you do give this recipe a try. Super easy to make! January 20, 2017 at 8:26 pm Oh yeah. I can't wait to try this! Seriously, can't wait!! January 23, 2017 at 10:47 am I miss it EVERY DAY :) That's why I make Mexican food at home every week. Thanks so much Lane & Holly! January 21, 2017 at 8:42 am All these ingredients combined together, must be very delicious, Kristine! Can't wait to taste this! 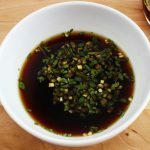 January 23, 2017 at 10:45 am It really is :) I hope you try this recipe out Agness! January 23, 2017 at 10:44 am It really is Patricia! Thanks for checking this recipe out! January 23, 2017 at 10:41 am Me too Gennifer!! Thanks for checking out the recipe!